Wet n Wild It’s My Cheat Day Refreshing Hair Mist ($8.99) is a new hair refresher mist that can be used anytime, anywhere to instantly freshen up hair with a light, subtle fragrance. This launched with Wet n Wild’s new Pump Collection for Spring 2019 which, insert rolling eyes here, is a new Athleisure Makeup and Beauty Collection. We’ve already discussed that I’m not really a big fan of these gym to street collections. Maybelline teamed up with Puma to create one but prior to that Tarte had one as well as E.L.F. not to mention any other number of brands. I sort of get the idea they are trying to sell here. You’re working out, maybe you see a hot guy, you want to look good. Or maybe they are selling the fact that your makeup will be long-wearing and can take you from a sweaty workout right into an evening out without the need for touch ups. Who knows?! I like the idea of long-wearing makeup that could be waterproof or even sweatproof. Something I can wear on a Summer day without it melting away. However, I’m really not into the idea of wearing makeup at the gym! Mind you, I have my own home gym which means this really defeats the purpose completely for me. That being said I don’t knock anyone who wants to look good at the gym! I just don’t always get the idea of wanting to wear a bunch of makeup while you’re sweating to the oldies you know? I can get behind products like It’s My Cheat Day Refreshing Hair Mist though! I mean, granted, I tend to work out early in the AM and I shower after. But if a shower isn’t possible for you this might be a nice one to tuck in your bag to freshen up your hair after a work out. Or if you’re a smoker you can mist it on to mask the small of smoke. I probably sound like a broken record as you’ve heard me mention it before but Pantene used to make this amazing hair refresher that smells amazing. Sadly, this isn’t even close to that formula! This is a really subtle fresh scent which adds a little softness to my hair a hint of fragrance. It’s not overpowering if you’re sensitive but could be disappointing if you’re looking for a heavier and longer lasting fragrance. I actually have it stashed in my desk drawer as at the end of the day when I’m headed out I’ll take down my hair, shake it out, mist this on, and I’m good to go about my evening. I tend to tuck my hair back as you know when I’m at work. This is a nice way to freshen up my hair at the end of the day. Although, at 1.7 oz at $8.99 it is a bit expensive! Probably not. Like I said, it’s a bit expensive at this size! I’m sure someone at the drugstore has hair refresher that will set you back $5 or $6 bucks and it’ll be a bigger size. And it’ll likely mask the smell of smoke a lot better! I fear the idea of gym makeup is that we’re supposed to look and smell flawlessly feminine there too. No, sorry, I look like a dripping tomato and make horrible grunting noises in the gym. I’m clean, I try not to smell (and will think quite carefully about deodorant choices and sweat towels), but my face is not and will never be on point while I’m working out. lol! that’s real right there Amy and all truth ;-D I hear ya! I’m not really interested or worried about looking awesome at the gym! This entire collection has made its way to my local CVS, but the only piece that got my attention is the new foundation, which is amazing! I had $5 CVSBucks, so I took a chance, and am so happy I did. Granted it’s been unusually cold here in L.A., but I think it’ll end up holding well when it warm up. It’s a fairly light coverage foundation, but it’s fits my needs, and is perfect for weekends or running errands. It also comes with a corrector & cream highlighter in the cap, which is pretty convenient, LOL! I don’t work out at the gym, though I should, but I do have a horrible problem of sweating, especially in the hot months. It’s part genetics, part side effects of medication, and just part me. I run really hot all the time. I easily work up a sweat running errands and grocery shopping, the warmer the store is kept the worse. I don’t get smelly, I just get soaked from the shoulders up. This product might not be for me, since I wear my hair in a super short spiky pixie cut and am already looking like a drowned rat most of the time, so the last thing I need is more moisture in my hair, I am interested in several of the other products in the line. In the late 90s L’Oreal Studio Line had two hair refreshers – one was blue and one was yellow, and they smelled AMAZING. That was when I was going out to concerts several times a week, and when smoking was still allowed inside, and it worked super well to get rid of the nasty stale smoke smell in my hair. I think it was Gee, your hair smells amazing!!!!! the L’Oreal hair refreshers? No they weren’t called that! That was such a weird ad, I remember those!! Gee, your hair smells terrific! I’ve always worn makeup to the gym. I’ve always worn makeup and heels to the grocery store, too. I wear it every single day to college, too, no exceptions. By the time I’m done at the gym, my foundation will have sweated off, but that’s no biggie. 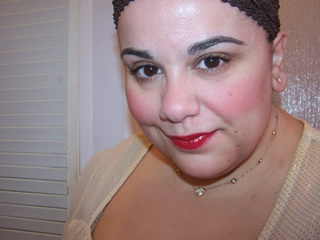 Some of us just enjoy the way we feel with filled in eyebrows, some sheer foundation, and a red lip!